One sunny Texas Thanksgiving Day, I donned my brand new basketball pants and sweater and challenged my mom to a game. We had 2 super super handsome male guests over for Thanksgiving while they were away from their families for the holiday. This 15-year-old was in lurv. I dribbled down the drive, going for a layup, just as the guys came out to play with us. I tripped over my own clumsy foot. Tore my brand new pants. Embarrassed the crap out of myself. The poor woman wasn’t even near me. Dashing into the house to clean up, instead, I ran up the stairs, threw myself on the bed and cried. I want to throat punch embarrassment. In fact, I want to throat punch people that embarrass me, and people around me when I’m embarrassed. I hate embarrassment so much, in fact, I want to help you avoid it at all costs. 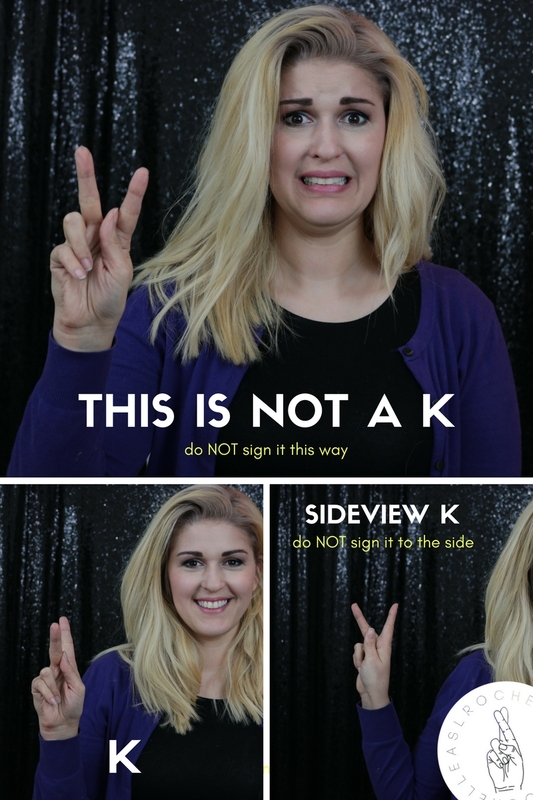 I’ve got lots of tips and tricks to share with you to avoid it, but for today, we’ll just focus on the ASL alphabet and the common problem letters. Because, dude… it’s embarrassing to have people correcting you all the time. Download the Drill Sheet to practice the tricky letters, test yourself, and develop good fingerspelling habits. I see several different problems and mistakes, so we’re going to take them one by one by one by one by one (what movie, y’all?) and show the mistakes and the fixes. For more visual examples, be sure to zip through the video, if there are any that you aren't sure on. You’re right, H should be held sideways, just make sure it’s facing the correct direction-- your palm is facing your body. The ONLY 2 letters to ever face sideways are G and H. That’s it. Keep your palm facing forward for every other letter. You can even sign G facing forward. These letter pairs are often mixed up. People will either completely forget the letter or will sign the other letter instead. Not to worry. I’ve got your solution here. D looks like a lowercase d when you look at its side. F has 3 feathers on top of it. S has the thumb across the fingers and T has the thumb tucked between the middle and index finger. You can remember S with sucker punch, with your hand in a fist as though you were about to sucker punch some poor fella. Most people get stuck on these all together. They know they know them, but WHAT are they?? Some people even know they’re similar to G & K, but get mixed up. Don’t sweat it. It’s no big deal if you get stuck a bit. Q is G with your palm facing the ground. It’s a mini duck bill that goes Quack-Quack at your feet. Sound silly? I know… but silly helps things stick. K is P with your palm facing the ground. It’s sitting down to Pee. This is an easy one to fix. These are generally more of an issue for left-handed signers. Your J’s & Z’s will be backwards. It’s not because we don’t love you. It’s because we do. The J’s are hooked in toward you and not out away from you. Some letters are just plain signed incorrectly. These are your highest priority to fix first. G: You can point this one forward or sideways. Make sure your other fingers are under control. E: get your fingers down on top of your thumb or else it’s a screaming E and can be confused with a C.
K: your fingers are not in a V shape with the thumb between, instead, the middle finger is extended forward and the thumb rests on the knuckle. T: keep your index finger resting lightly on your thumb and don’t push it down against your palm. I: (not mentioned in the video) keep your thumb across your knuckles or it can be confused with a Y. This is one I can be guilty of. To help, sometimes I press my thumb onto my index finger with a slight bend to make sure it’s not sticking out. Give yourself an honest evaluation. You may need to whip out your trusty camera and video yourself fingerspelling some words and watch it back. You’ll catch more mistakes this way over watching yourself in the mirror. You won’t be able to shift something when you see it wrong and you won’t be able to say, oh that’s good enough. Seeing yourself on video will be very clear and easy to see where you slip up. I created a drill sheet with lots of words that have the problem letters as well as the rest of the letters in the alphabet. You can use this sheet to test yourself as well as drill the letters that give you trouble. Now you too, can avoid hiding in your room for hours, with torn pants, and damaged pride. I just grabbed FREE practice sheets to help me nail my fingerspelling! Question: Which ASL letter gives you the most trouble?